rban forestry is the sustained planting, protection, maintenance and care of trees, forests, greenspace and related resources in and around cities and communities for economic, environmental, social and public health benefits (Blouin and Comeau, 1993). Report preparation, assessment and advice. Expert witness services for legal proceedings. 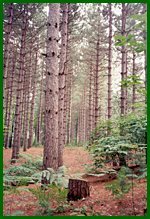 All of our consultations are undertaken by a Registered Professional Forester (B.Sc.F.) with the assistance of forestry technicians when required. ntegrated forest management – the management of forests taking into consideration multiple objectives such as wildlife, recreation and urban development – leads to healthier forests and a better balanced forest ecosystem. A properly researched and designed forest management plan documents the “why”, “what”, “when”, “where” and “how” of forest management. It includes the owner’s goals and objectives, a map detailing the inventory of the forest and its components, a prescription of the silvicultural systems to be used in establishing or improving each stand, a schedule of forest operations and a time line as to when each of the owner’s goals will be achieved. A complete plan will also provide advice on how to monitor the results of management activities. IFS Associates has experience in providing forestry consulting services across Canada and internationally. Please see some of our Projects for further information on the nature and scope of our work.